It’s been an encouraging week, with two trips to London. On Tuesday, I learned from the UK Plant Science Federation (http://www.plantsci.org.uk) that there had been a total of 145 applications from undergraduate students for 4 Defra-funded Plant Health summer studentships. Though obviously disappointing for the unsuccessful applicants, this shows a clear demand and student interest in plant health, which is brilliant. On Thursday, I went to the RHS Chels ea Flower Show (https://www.rhs.org.uk/shows-events/rhs-chelsea-flower-show) and was really pleased to see a good spread of science represented in the Discovery Zone with stands from the Animal and Plant Health Agency; the British Ecological Society, Kew Gardens and CABI. 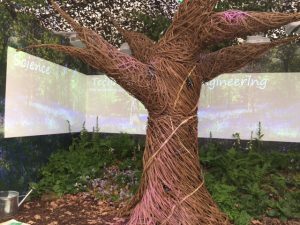 I last visited the show in 2011, where the only academic science represented was Horticulture from the University of Reading and engineering from the University of Sheffield. Image shows The Animal and Plant Health Agency stand on STEM (Science, Technology, Engineering and Maths). I was also impressed that the Maltese show garden was selected as the best show garden. It was a brave move to applaud dry gardening in this way, and one that was bound not to appeal to everyone, but which shows the vulnerability of landscapes to high temperatures and low water availability – a scenario that could become more widespread. Given the reach of the Chelsea flower show through TV and other coverage, it is really encouraging to see some of the global plant science challenges and a greater awareness of the professional roles and work of plant scientists presented to this broad audience.